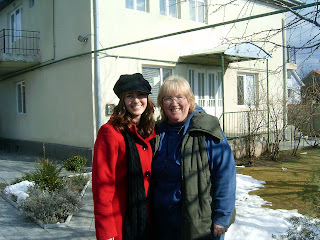 Barb In Moldova: Happy St. Patrick's Day! They tell me it's time to post again on my blog. And I see it's true - I didn't post anything last week but I have an excuse. I was busy writing and sending my newsletter last week. So - if you are not on the e-mail or mailing list for my newsletter - and you want to be - please do send me an e-mail (Barbtherev@yahoo.ca) and let me know. I will be glad to add you and send you the March 2007 edition. But now please don't think that there has been nothing happening in my life. Obviously life goes on, even when the blog doesn't. You will be happy to know that my car is now faithfully chugging along and taking me where I need to go, carefully doing all she can to avoid being stopped by the friendly neighbourhood politei (police). 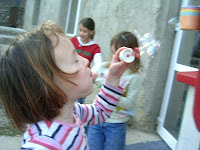 Some of the things that have happened recently include Cherise's departure from OM Moldova. Cherise was with us for six months and now has returned to Texas, with a few adventures on the way... (What happens when you get on the wrong train in London and consequently can't get to the airport in time to catch your flight, Cherise?) Here's a picture of me and Cherise in front of the girl's house on the day she left. And just after Cherise left, the Challenge into Missions participants began to arrive. We have already had a week with the leadership group and just this past Thursday all the rest arrived - a total of more than 20 young adults to be with us for training over the next 10 weeks. 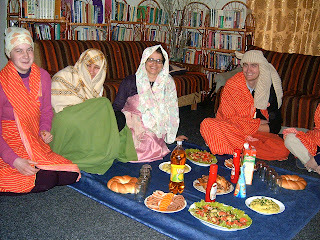 One of the events we did with the leaders was to have a cross-cultural simulation experience in the form of a Moroccan meal! Today is St. Patrick's Day (you may have noticed the green text) - a day to honour one of the great missionaries. It was also Matthew and David Skirton's birthday - and Jeanine Dommerholt's too! Happy birthday, to each one of you. I'll only tell you, though, that David is one year old - and he is a cutie - all boy, as you can tell by his handling of the birthday gift his folks gave him! In training we did a psychological inventory that determined whether we were drivers, harmonizers, motivators, or detailers. 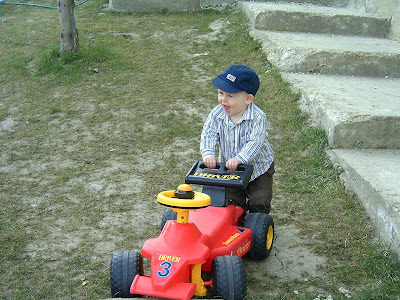 Doesn't it look like David may grow up to be a driver?!! Posted by Barb at 1:01 a.m.